Over-Plucked Eyebrows – There’s Still Hope! Over plucked eyebrows a problem in your life? Brows are a main focal point of the face and overall frame the face. Brow trauma is a real thing and can easily happen when getting carried away in front of the mirror plucking or in a salon chair getting waxed frequently. Sometimes you don’t realize how important brows are to the face until they become over-tweezed. You might wait and wait hoping they grow back but the majority of the time they never grow back like you’d hope. Well, we have a solution! The solution is microblading. Microblading is a form of semi-permanent makeup that gives the illusion of real hair like strokes. It is done with a manual hand tool, giving very natural results. We understand that over-plucked or over waxed areas in the brow sometimes just don’t grow back and it’s out of your control! That’s right, it looks like REAL hair! We create the perfect eyebrow that suits you then from there we start the actual process of microblading. Microblading can last up to a year as well. So don’t panic if you’ve over-plucked or over waxed your eyebrows! Click here to learn more about what microblading exactly is! Another uh oh is if you’ve gotten your brows waxed and they didn’t end up how you wanted them to. We hear stories like this all the time from clients. They waxed their brows and took off too much hair and now they’re unhappy. Or they waxed the brow in too much so the shape looks funky and now they’re uneven. Asymmetry is a big no-no and is easily noticeable. Microblading requires certain pigments that are specially designed for this process so the color easily matches your natural hair color and looks very natural. It is not a classic tattoo as those inks are known to turn blue and gray often. Also, microblading lasts closer to a year give or take on skin type. 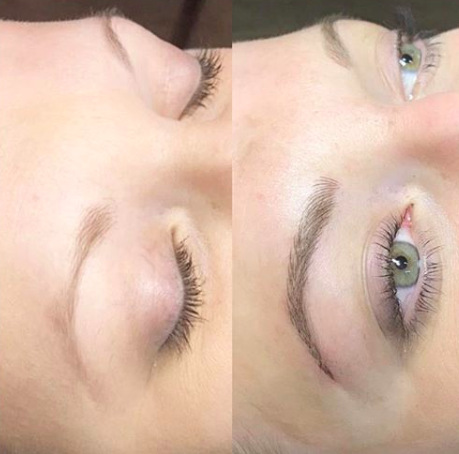 The best part about microblading is how natural it looks as well as saving you time in the morning if you are one to pencil your brows in as well as adding confidence. Confidence is very powerful and allows you to achieve a lot in life. Well, now that you have a solution you are in control of gaining your brow back! Crazy to think about right? It’s so rewarding seeing the client’s reaction to the after the result. You forget what you looked like with complete brows. Often times than not the brows we give are even better than the clients original brows even before they were over plucked they tell us. We are able to recreate the shape, length, and overall fullness of your brows. As I’m sure you’ve heard of the saying “eyebrows are sisters, not twins,” well with microblading this isn’t the case. They can be twins!! So you have a solution to getting your brows back immediately and it looks super natural! What are you waiting for? Let us help you restore your over-plucked or over waxed your eyebrows today. Check out how long microblading lasts here! Visit our FAQ library here!